It’s time, once again, for the On DVD series featuring new releases from Paramount Home Entertainment & Sony Home Entertainment. I still love network sitcoms, I probably always will, and since its very first episode The Goldbergs has been one of the best out there. It’s heartfelt, goofy, self-aware, and packed with bravura performances from legends (Jeff Garlin, international treasure Wendi McLendon-Covey) and emerging talent alike (Sean Giambrone, Hayley Orrantia, and Troy Gentile are the best teenagers on TV). The latest season made more room for personal favourite TV boyfriend Geoff Schwartz (Sam Lerner) and launched TV’s supermom into “The Bevolution”. This show is so consistent and rewatchable that I’ll even say the DVD is worth having despite a totally lame set of special features. This Blu-ray is a must- have for a few reasons. 1) because this show is still very much kicking more than two decades in. 2) because its political commentary makes it a perfect time capsule and that’s half the fun of collecting DVDs. 3) There are only two special features but they’re a lot of bang for your buck with both mini-commentaries from the creators and #SocialCommentary on every single episode. 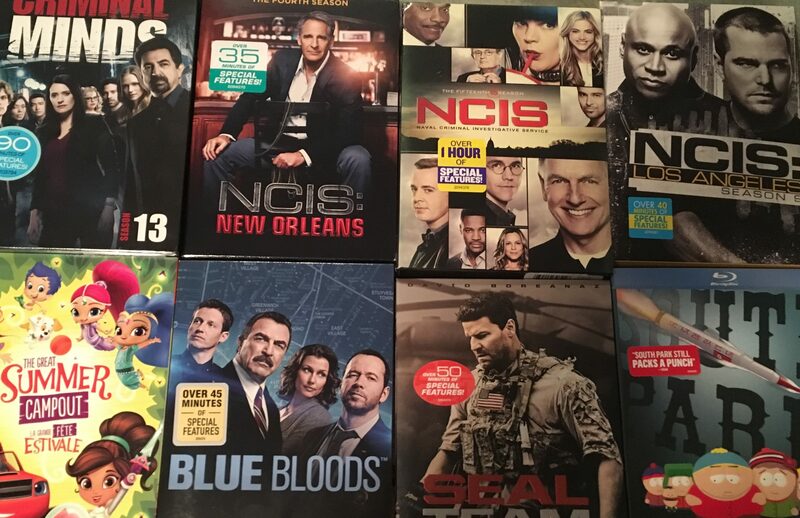 Whereas this is a skippable set unless you’re weirdly completist about your CBS procedural collection. The special features are decent and 200 episodes is definitely a landmark worth celebrating but none of these episodes are really worth a rewatch. See “NCIS: Los Angeles” except without the 200th episode or LL Cool J. Now this one’s a little bit different. I might actually argue this set is worth having even though procedurals aren’t really rewatchable. Some episodes have audio commentary and there are some good featurettes but, most importantly, this is Pauley Perrette’s last season and, if you care about NCIS at all, that’s a big deal. See “NCIS: New Orleans” except this show is a tiny bit more emotionally rewarding. There’s also a neat special feature on visual effects. As far as CBS procedurals go, Criminal Minds is kinda cool but, generally, I’m gonna say the same thing about this one. Just pass unless you’re a serious collector. The special features are mostly pretty surface-y but the set does include the pilot episode of two other shows, which is kind of a cool bonus. One of those shows is unfortunately SEAL Team (more on that in a moment) but the other is Bull and I actually really like Bull (why didn’t I get Bull? Surely that DVD came out too). Are you super into David Boreanaz’s post-Angel macho guy career but didn’t like all the funny parts of Bones? Have I got the show for you. Mediocre special features but at least the effort was made. This Nickelodeon disk is the perfect all-star sample platter of modern kids hits. It includes one episode each of Bubble Guppies, Shimmer & Shine, Blaze and the Monster Machines, Sunny Day, and Nella the Princess Knight. It won’t get you super far with actual kids, who tend to be obsessive about one thing rather than looking for variety, but if you’re looking for a good way to get a sense of what’s out there and maybe find out what their favourite is before investing in a whole set of that one show, this is kind of perfect. Perennially underrated Giovanni Ribisi plays a con man in this crime drama from House head honcho David Shore. The supporting cast is great (oh hello, Character Actress Margo Martindale!) and this is exactly the sort of show that’s worth owning to watch multiple times, especially considering season two is already out and season three is on its way.